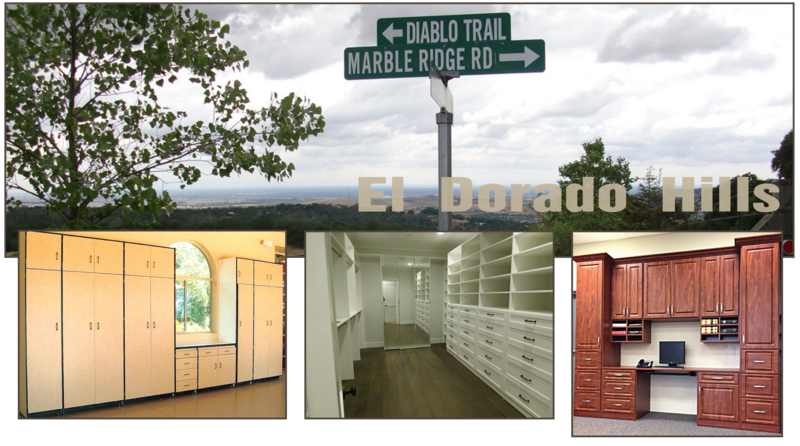 El Dorado Hills, California - Alpine Cabinet Company "
Custom storage and organization can be yours in El Dorado Hills. You choose the cabinet design, lighting and finishes with a free in-home estimate, professional consultation, and installation. Alpine Cabinet Company has built and installed garage cabinets, custom closets, home offices, and home entertainment centers in El Dorado Hills since 1984. As a locally owned company, we guarantee that you receive personal and professional services that include custom design service and installation. Thanks to El Dorado Hills customers, we now operate out of a 25,000 square foot facility where we custom build all of our cabinets. Our garage cabinetry allows you to organize all your tools, garden implements, sports equipment and anything else you want to store. Closets that hold all of your apparel and more, organized the way you require. We install home offices that meet your professional and personal needs with the custom finishes you want. Store your electronics and display your collectibles in a beautiful home entertainment center, including motorized TV stands. Explore the possibilities by contacting us to discuss how we can provide your storage and organization solutions. Serving El Dorado Hills and the surrounding communities such as Summit Village, Cameron Park, Clarksville and White Rock.